A readathon just isn’t complete without a smattering of du Maurier. I haven’t read any du Maurier in a while – though I’m trying to work my way through her bibliography there is such a thing as too much of a good thing! Though, I always find her short story collections a good addition to any readathon! The Doll is a collection of her early works – written in the late 20s and early 30s in the majority – some predate her first novel. While it’s clear to tell this is early work, it is by no means awful. Her early work is very much a good indication of what is to come in her career, all her signature tropes are there and ultimately this is great. As always, it is her use of atmosphere which is prominent and, in my opinion, the most wonderful aspect of her writing. There is great variety in the types of stories that are present in this collection; an overarching theme is romance I think, but the darker side of it. There is a lot of themes that are then further explored in some of her full-length novels (or at least the few that I have read) such as jealousy. I liked seeing that early ‘thought process’ that she clearly started within a short story format. Some of these did feel ‘half-baked’ on the plot side of things, and it’s a good judge of what was to come from her writing. It isn’t a short story collection that I would recommend to a friend who wasn’t either familiar with du Maurier’s writing and wanted to explore her bibliography more or wasn’t all that familiar with the short story ‘genre’ (if you can call it a genre in it’s own right). It is definitely more for the du Maurier ‘completist’ than a place to start with her writing. It is a lot more varied, there is a lot more character studies, but it was good. As for a favourite, I don’t really have one but it is the titular story that has stuck with me through reading this collection. It was the second story. It was weird. When it was written, it must have caused scandal. It was bold and showed a woman as “sexually immoral”. It is told to us through a letter; while the author is unknown, it is understood that it is a confession of sorts about a peculiar situation about a woman the writer of the letter was involved with who had a fetish for a doll. I can see why it was ‘lost’; I don’t think, back in the 1920s this would have been published, especially by a woman, about a woman! It was definitely one of the more explored and experimental of the collection and while reading it I couldn’t help but be linking things to Rebecca because it had that overall tone. I think it’s probably why it has stuck with me! It was not an awful collection, but I don’t feel it was her best (I would say possibly The Rendezvous is her best collection, or at least the one I have fondest memories of reading, followed by The Birds very close behind!) It was definitely a good indication of where her career was heading and reading these stories was really a highlight in me reading her bibliograpgy, there was just so much that was good in these and seeing the potential that was there was really great as a du Maurier completist! This was her beginning; it wasn’t perfect, but I really I loved reading it. It’s a high 3/5 for these as some were much better than others! Though I own a few Persephone books, this is the first I read and it was not in any way a disappointment. When I picked this up in a shop I had a feeling it was going to be one of those books that I just cuddled up and read – I wasn’t wrong! It’s the story of the second world war as seen through the eyes of a group of children, the Wiltshire siblings, who have had a very upper-middle class background. The tone of the book at the start is no indication of how the story progresses as, ultimately, this book is heartbreaking! By the end of this book, most of the characters are detestable but you understand why they’re that way. Laurel wants to be loved, Tony is grieving, Kim wants attention and little Tuesday is just so damaged by what the war has done to her family that she’s hardly functioning. Seeing how a war has shaped these children and altered their family dynamic is really sad and, honestly, it isn’t something that I’ve seen explored in literature before. It’s really hard to describe this book because, it isn’t really plot heavy, it is definitely a character study of events that pretty much everyone is familiar with, just told through new eyes. I think the nature of observing WWII through the eyes of children was something new and, actually, a very novel way to look at war. I’ve read very little fiction set around wars, especially WWI and WWII but it’s just not something that interests me (and I know that probably sounds a little bad, but it’s just not my thing). However, I think this was a really good look at it. Once I started this book I couldn’t put it down. I had to, but I didn’t want to, and I read it in 3 sittings. I just love Noel Streatfeild’s writing, it’s fluid, it’s simple but it is absolutely wonderful. There were a lot of parallels in style with that of Ballet Shoes but it was definitely a lot more grown up and far less sunshine and rainbows! I think it could have been explored a bit more, some bits were surplus but on the whole it was wonderful. It was a cozy read in spite of the background and the story material. I’d happily recommend this to anyone who likes her children’s writing, enjoys WWII novels or just loves books about family dynamics. 4/5! So, what better way to get started with June and enjoy freedom than to take part in a readathon?! #TBRTakedown was created by Shannon over on BookTube. It’s a week long readathon so it’s right up my street as it means I can invest time in slightly longer books! 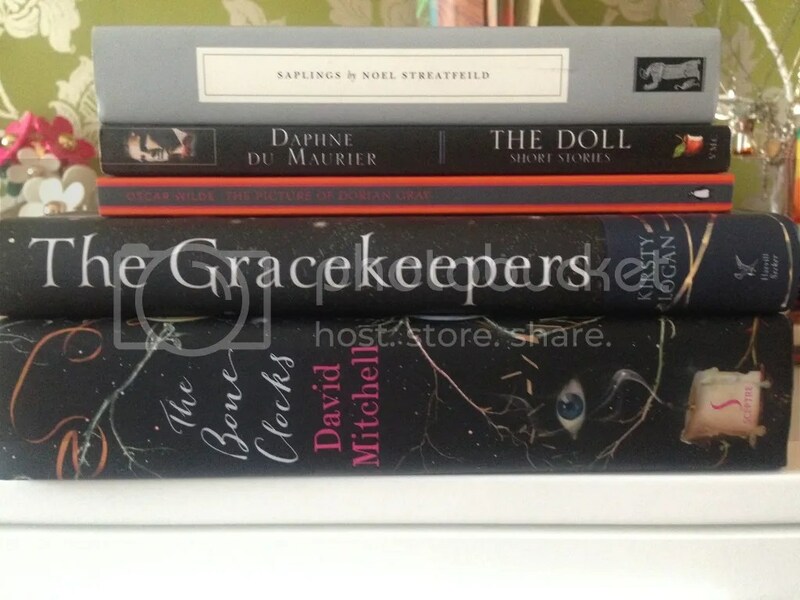 So, we have two from my June TBR – The Bone Clocks and The Gracekeepers. My main reason for trying to read both of these is they’re bulky and I don’t want to take them on holiday with me later in the month. So get them done sooner! Then we have The Picture of Dorian Gray which is a classic that has been sat on my shelf for months. I can’t wait to read this. It’s not very long and I’ve only ever heard good things about it so I’m looking forward to it! Next up is a short story collection, and not only that it is a short story collection by the wonderful Daphne du Maurier. I love short stories during readathons to break bigger books up and I love du Maurier so this was a no brainer! I picked The Doll and Other Stories because they’re her earlier, only recently discovered short stories and I love her early work! Finally we have a Persephone classic and I picked Saplings by Noel Streatfield. I loved Ballet Shoes, it remains one of my favourite childhood books and when I discovered she wrote for adults I was excited. This book is one I actually cannot wait to get around to. I’m being ambitious; I know. But when am I not? I’d love to hear if any of you are taking part in any readathons this month and can point me in the general direction of them! I will, as always, be reviewing all of these books and if there are any you think I should pick up earlier in the week, let me know!